Ugly, unkempt, a haunter of low dives who begs for a living and lives on the street, Zacharias Lichter exists for all that in a state of unlikely rapture. After being engulfed by a divine flame as a teenager, Zacharias has devoted his days to doing nothing at all—apart, that is, from composing the odd poem he immediately throws away and consorting with a handful of stray friends: Poldy, for example, the catatonic alcoholic whom Zacharias considers a brilliant philosopher, or another more vigorous barfly whose prolific output of pornographic verses has won him the nickname of the Poet. Zacharias is a kind of holy fool, but one whose foolery calls in question both social convention and conventional wisdom. He is as much skeptic as ecstatic, affirming above all the truth of perplexity. This of course is what makes him a permanent outrage to the powers that be, be they reactionary or revolutionary, and to all other self-appointed champions of morality who are blind to their own absurdity. The only thing that scares Zacharias is that all-purpose servant of conformity, the psychiatrist. A literary jewel of eccentricity seen as an ethical provocation, which created an unforgettable shock at a time when the mental stereotype imposed by the dictatorship was dimly trying to find the first slits for a breakthrough....The writer summons, in an artistic undertaking that is ever vigorous and vibrant, the fundamental questions of existence, the ephemeral and the transcendent stimulating each other in a dynamic exchange of energy, with original and seductive accords of lasting resonance. A once-subversive, picaresque life of an imagined philosopher who speaks in torrents and trades in absurdity. The Life and Opinions of Zacharias Lichter is presented as a sort of collection of biographical sketches of its titular hero, a shopkeeper's son who was a promising scholar -- "He graduated with an outstanding dissertation on the Enneads of Plotinus" -- who not only abandoned the academy but any sort of role in traditional bourgeois society. He haunts the city's street and parks, "clothed in squalid beggar's rags", and he does occasionally go around actually begging -- his appearance, surely, rather than his line ("Help a poor metaphysician"), apparently convincing enough that he can collect enough to sustain himself. Lichter is a wandering, public philosopher -- with disciples, as in ancient Athens (though they are not a major presence here) --, and not one given to quiet reflection: "Words burst from his mouth in torrents". He is very much the kind of word-person who believes in speech over writing. Only rarely does he write anything down -- often a poem, which he then often tosses aside as soon as he's put it down on paper. A shadow(y)-biographer collects and presents this material on Leader: the novel is presented in short chapters of only a few pages each, each focused on a different aspect or opinion of the strange man. Many describe Lichter's attitude and opinion on specific subjects -- 'On Courage', 'On Women', 'On Poetry', 'On Mirrors', 'On Self-Indulgence' --, making for a collection that captures much of the breadth of Lichter's personal philosophy. A few of Lichter's poems -- some rescued by his biographer from the trash -- are also interspersed in the text; Lichter's attitude towards poetry is ambivalent: on the one hand he wants to distance himself from it, casting aside his own poetry as soon as he's set it down; on the other, he wonders (and shudders): "am I myself anything other than a poet ?" An Epilogue-chapter has Lichter confront his (would-be) biographer -- denouncing the project, and arguing that: "you are writing about yourself, not me". Not that he wants the biographer to write about him, either -- or, if so, at least have it be a "fictional life"; instead, he finds himself annoyed by the biographer's "serious-mindedness". For all the serious-mindedness he accuses his biographer of, Lichter nevertheless is presented, and comes across, as a larger (and louder) than life figure, and even if he's not quite the: "combination of Diogenes, Nasreddin, and a Jewish prophet" that some eventually begin to see him as in their tall tales about the picaresque figure, one can see where they're coming from. Lichter is on board, too: "Haven't I tried to be a clown to the very end, unto madness ?" The serious biographer won't go quite that far -- the Lichter that comes across in this portrait is neither sad nor ridiculous clown-figure, but rather only clownish in his extremes. The Life and Opinions of Zacharias Lichter is a portrait and exploration of a man living true to his searching philosophy, not an entertainer -- though there's an undeniable showmanship element to how he presents and conducts himself. There are few individuals in Lichter's world, with much that the biographer describes a world of 'him' versus and/or in contrast to 'them' (and, often, 'us'); even the biographer is just one more awe-struck follower among presumably many. Lichter does engage with some individuals however, from regularly reading the Bible to an old woman to spending time with his one close friend, the hard-drinking and almost entirely wordless Leopold 'Poldy' Nacht, whom the teetotaler Lichter considers: "one of the great philosophers of contemporary Europe". Lichter is in awe of and aspires to Poldy's thinking, "free of all signification". A comic contrast is a professor of English phonetics, Adrian Leonescu, whose: "complete lack of interest in ideas is compensated for by his remarkable ability to pronounce words" -- a void of meaning that is the antithesis of Lichter's constant (but presumably not quite so well-pronounced) meaning-full spouting. Here, as in much of the story, there is -- notwithstanding Lichter's concluding complaints -- actually quite a bit of humor, tending nicely to the absurd. Calinescu's unusual novel quite impressively presents this figure, and a life lived according to specific ideas and ideals that stand in contrast to the bourgeois society around him. Lichter isn't simply a critical outsider, but manages to almost inhabit a parallel world, going his own way with little concern for the conventions that he nevertheless is familiar and occasionally prods and teases. He is very much a 'character', but the narrator-as-biographer reveals more of the depth to his thinking and actions -- profound reflection couched in the presentation of this colorful character. The Life and Opinions of Zacharias Lichter is also about how to capture and convey thought and experience (and 'truth'); the question of language extends to, for example, a chapter: 'On Mathematical Language', while the ridiculous phonetic-man Adrian Leonescu is another (extreme) manifestation. Meanwhile, Lichter's speech and accompanying wild gesticulations are described early on already as if: "his entire being is partaking in the violent effor of expression, as if imbued with the necessity of saying". Appropriately, Calinescu pays close attention to form and expression in his writing, and much of the novel is quite stylized, the sentences and descriptions carefully phrased; so too, there's much concision -- all in contrast to what is described (but never presented) as Lichter's torrents of words, or the long time-spans of much of his (in)activity. The question of speech -- embraced by Lichter -- versus the written word -- chosen by his biographer -- is also one brought up repeatedly over the course of the novel. 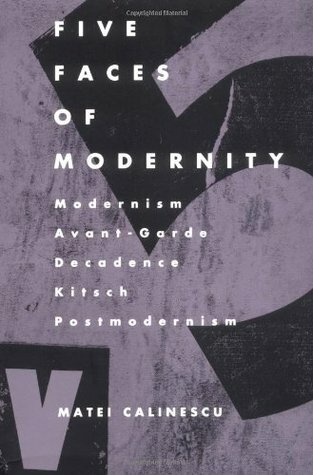 Matei Calinescu, Five Faces of Modernity: Modernism, Avant-garde, Decadence, Kitsch, Postmodernism, Duke University Press Books; 2 ed., 1987. 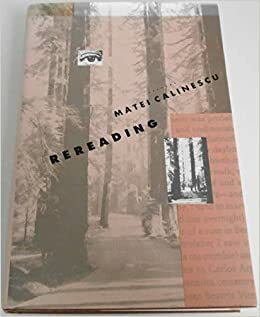 Matei Calinescu, Rereading, Yale University Press, 1993. What motivates us to reread literary works? How is our pleasure, interpretation, involvement, and evaluation different when we read a literary work and when we reread it? This fascinating book by Matei Calinescu is the first to focus on the implications of rereading for critical understanding. Drawing on literary theory, cultural anthropology, psychology, philosophy, and previous theories of reading, Calinescu describes the dynamics of rereading and explores the sometimes complementary, sometimes sharply conflicting relationships between reading and rereading. Calinescu analyzes fictional works by Borges, Nabokov, Proust, Robbe-Grillet, and Henry James, among others, explaining how reading texts is related both to symbolic play or make-believe and to games with rules. He reviews the history of reading in modern times, discussing, for example, how the Reformation led to rereadings of Scripture and how the proliferation of books during the Enlightenment led to a shift from "intensive reading" to "extensive reading." Calinescu looks at the distinctions between reading and rereading from the perspectives of the age, situation, and gender of the individual reader. He discusses the problems raised by secret or oblique languages and codes - devised to evade censors, communicate with a select audience of "secret sharers," or play games of hide-and-seek with the reader - and shows that they naturally lead to rereading a text. Calinescu argues persuasively that an understanding of rereading is useful in formulating both analytic strategies of practical criticism and a poetics of reading.